The Duluth East Greyhounds finished off their 2017-18 season taking 2nd place in the Minnesota State High School Hockey Tournament, with a 5-2 loss to the top-ranked Minnetonka Skippers. Anyone watching the final game would agree that both teams played very well and, if the nets were just one inch bigger, the outcome would have been different. The EDHC offers congratulations to the entire team and coaching staff for providing us with some great performances during this past season. We're already looking forward to next year! 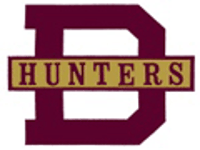 Congratulations to the Duluth Denfeld Hunters and Coach Dale Jago for finishing the 2017-18 season in an exciting fashion, winning their last five regular season games and taking I-Falls into two overtimes before bowing out with a 3-2 final score. With a strong group of youth players in the wings, we can't wait to see what the 2018-19 season brings for Hunters Hockey. There's no doubt that area hockey fans got their money's worth of entertainment during the 7th Annual Perkin's Frenzy as both games were decided by 3-2 scores. 1,500 fans chose to see live action over the comfort of home and the My9 telecast , when they crowded into the Essentia Duluth Heritage Center (EDHC) to watch the Superior Spartans held off a determined Denfeld Hunter team 3-2. The Spartans got off to a 3-0 lead before the Hunters came back with the final two goals. In the nightcap, Duluth East scored first with an early goal during the first two minutes of play, with Duluth Marshall responding in the second period with two goals of their own, with the second goal coming with no time remaining. East tied the score with the only goal during the third period, taking the game into overtime to earn the win. Duluth Heritage Sports Center Foundation (Foundation) Chair Patrick Francisco announced today that the Foundation recently received a very generous gift of stock from the Herbert A. Fritch Family Foundation, having a value of $1.6 million dollars. This gift came close on the heels of a $1 million dollar gift from an anonymous donor and these two gifts combined enabled the Foundation to acquire the remaining Duluth Heritage Sports Center (Center) construction debt from Alerus Bank. Throughout the years, the Foundation has used the contributions received to acquire portions of the Center’s construction debt from the conventional lenders who held it, gradually gaining the major portion of that debt. With this recent acquisition, the Foundation will now be the sole holder of the Center’s construction debt. According to the Center’s President/CEO, Jerry DeMeo, the terms arranged with the Foundation are quite favorable. “This is truly a great time for the Center and for our entire community.” DeMeo said. “The interest schedule from the Foundation will not unduly burden our budget. We’re able to meet this obligation while still preserving capital to meet our future planned facility and equipment needs”. Recently, it seems as though ice skating has become a popular choice for both physical exercise and classroom diversion for elementary school students. On November 23, the 1st grade class from Piedmont Elementary got the chance to don skates and burn off some energy. On December 19, approximately 300 youth from North Star Academy's grades K thru 2 took to the ice, many of them for the first time, followed on December 20 by the 3rd grade classes from Lester Park Elementary. According to EDHC's Administrative Assistant Shari Olson, it's been a win-win situation for both the kids and the EDHC. The ice availability during the school day affords an economical opportunity for the kids, while enabling the schools to supplement their needs to provide more physical activities to their daily regimen. Ice skates for those not having them are made available through cooperation with the City of Duluth Parks & Recreation Department. On Tuesday, December 6, over 150 youth & their familes from Laura MacArthur school and their K.E.Y Zone program gathered in Seitz Arena to interact with 60 men & women athletes from UMD, including UMD's mascot, Champ, for a skating/pizza party. 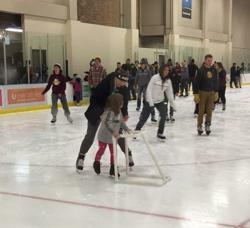 Volunteers from UMD's various athletic programs helped the kids lace up their skates and then aided the "first timers" to make their way around the ice. After skating, the entire group traveled over to the Clyde Iron Restaurant for pizza & refreshment. The skating party was made possible through a collaboration of the City of Duluth Parks & Recreational Department, who provided the skates, and the Duluth Heritage Sports Center Foundation, who made the ice available. Judging from the smiles on the faces of the youth, the adults and the athletes, it was a memorable event for all. On Wednesday, Nov. 23, youth from the Piedmont Elementary Schools 1st grade got a break from the classroom for a new phy ed experience...ice skating. For many of the kids, this was their first time on ice skates. They got this chance thanks to the efforts of both teachers and parents who wanted to put a new spin on keeping kids physically active. The activity also included a surprise visit from UMD's mascot Champ who participated in the skating while affording many photo-ops. Skates were furnished for those who didn't have them courtesy of the City of Duluth Parks & Recreation Department. The EDHC also chipped in, offering the ice free of charge. The kids thoroughly enjoyed the opportunity and it is expected that other schools may soon follow. Duluth's most notable hockey player recently added another "trophy" to his collection...this time it's a world record! Mark Sertich, at the age of 93 years, 11 months and 27 days was recently acknowledged as the oldest hockey player ever to play competitive hockey. Just 3 days prior to celebrating is 94th birthday, Sertie skated regular shifts with the Continental 75's, a team that participated in the Snoopy's Senior World Hockey Tournament and by doing so, carved a niche in hockey history that may only be exceeded by Mark himself. Sertie appeared on national television during the outdoor hockey game between the Minnesota Wild and the Chicago Blackhawks. As a guest of the Wild, he was interviewed between periods by former Blackhawk Jeremy Roenick, who asked Mark why he wasn't playing golf like others many other senior former athletes. Sertie's response was that he had never played golf but "always intended to take up the sport when he was done playing hockey. He just hasn't got there yet!" Mark Sertich can usually be found 2 or 3 days a week participating in the 8 o'clock skate with those much younger than him. But, as the date for the 2016 Snoopy's tournament nears (July 17), he'll likely add a day or two to that schedule. He wants to be in top skating form as he gets set to raise the age bar for hockey as a "life sport" even higher! In a four bracket tournament that closely resembled the NCAA basketball March Madness, the Duluth Heritage Sports Center rose from the 14th seed in the ”Best Barn” arena bracket to win the top spot in the 2014 Hockey Hotdish Tournament. The DHSC was voted by the readers of Let’s Play Hockey as the best ambassador for hockey in Minnesota, defeating legendary coach Herb Brooks in the championship match with 67 percent of the final vote. The other brackets were the “Beauty (players) , the “Bench Boss” (coaches) and the “Big Head” (mascots). The DHSC used strong support from the Duluth media to claim the Barn Bracket championship, earning the title as the Minnesota arena that best represents the State of Hockey. During competition in that bracket, the No. 14 seed DHSC defeated No. 3 Hibbing Memorial Arena (64 percent to 36 percent), No. 6 Mariucci Arena (53-47), No. 10 IRA Civic Center (61-39) and No. 4 Roseau Memorial Arena (70-30). The six-year-old facility then downed Big Head Bracket (mascots) champion Bucky Beaver in the tournament semifinals (77-23). Overall No. 1 seed Herb Brooks won the Bench Boss Bracket with wins over No. 16 Dave Peterson (72-28), No. 9 Lorne Grosso (84-16), No. 12 Bob Johnson (84-16) and No. 10 Dave Palmquist (64-36). Brooks then defeated Beauty Bracket (players) champion Neal Broten in the semifinals (71-29). The Hockey Hotdish Tournament is an annual competition from Let's Play Hockey to determine what Minnesota player, coach, arena and mascot best represent the State of Hockey. 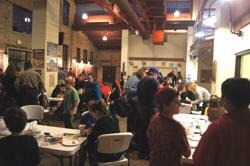 The tournament began with the selection and seeding of 64 entries in four brackets. Beginning June 9, voting in each round took place on a weekly basis on www.letsplayhockey.com and continued throughout the summer. 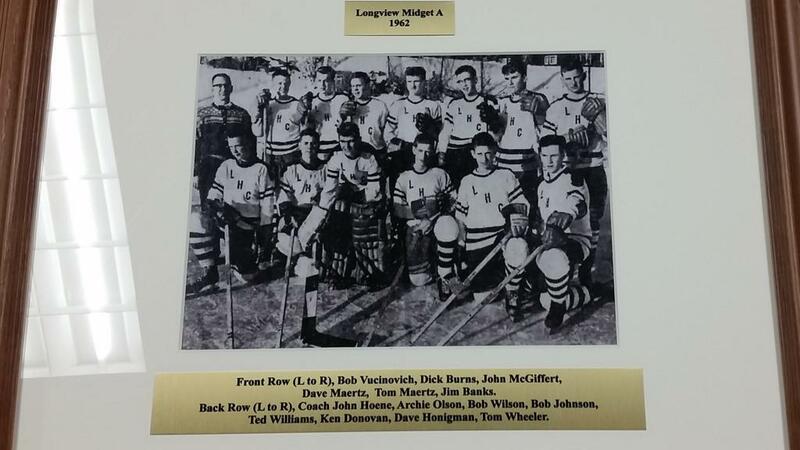 Photos depicting 24 Duluth teams who have attained the status of "Champions" in the sport of ice hockey are now in place on the "Duluth's Championship Heritage" wall, located at the northeast corner of Sill Arena. These teams represent Duluth's neighborhood rinks, high schools, juniors and adult programs who played their way to prominence in tournaments held at either the state or national level. The photos were gathered from family collections and prepared through a collaboration of talents from Duluth Camera Exchange and the Frame Corner & Gallery. The Duluth Heritage Sports Center (DHSC) remains in contention for the title of being the Minnesota ice arena that best represents the State of Hockey. Thanks to outstanding response from our supporters during the first round of the Hockey Hotdish Tournament’s “Barn” division”, the 14th seed DHSC outpolled #3 seed Hibbing’s Memorial Arena by a 64% to 36% margin and now moves on to compete against the Mariucci Arena in the second round. Minnesota’s oldest hockey newspaper, Let’s Play Hockey, is hosting this event which offers 4 brackets…Beauty (players), Bench Boss (Coaches), Barn (Arenas) and Big Head (Mascots). Duluth East’s coach Mike Randolph was among the Bench Bosses, losing out in the first round to Bloomington Jefferson’s long-time coach, Tom Saterdalen. In the Big Head (mascot) division, the Duluth East Greyhound will compete against the White Bear lake Bear. Voting for the Big Head division is now activated and will end on Sunday, July 6th. In addition to the DHSC, five of the remaining 8 arenas in the Barn division are from northern Minnesota. Still in the running are the no. 1 seed Eveleth Hippodrome, the Roseau Memorial Arena (#4), the Warroad Gardens (#5), Thief River Falls Ralph Englestad Arena (#9) and the IRA Civic Center, Grand Rapids (#10). ​ Voting in the Barn division will continue later in July, with the exact dates to be announced soon. Voting will again be online at www.letsplayhockey.com. 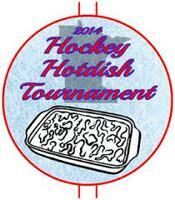 Click on the “Hockey Hotdish Tournament” and follow the prompts to the “Barn Bracket Round”. After outpolling the IRA Civic Center with 61% of the vote, the 14th ranked Duluth Heritage Sports Center (DHSC) finds itself up against 4th ranked Roseau’s Memorial Arena in the final round of Let’s Play Hockey’s online Hockey Hotdish Tournament‘s “Barn Division”. The winner of this round will own the bragging rights to the title of being Minnesota’s ice arena that best represents the State of Hockey. Minnesota’s oldest hockey newspaper, Let’s Play Hockey, hosts the event which offers 4 brackets…Beauty (players), Bench Boss (Coaches), Barn (Arenas) and Big Head (Mascots). In the “Beauty” bracket, John Mayasich outpolled fellow Eveleth native Frank Brimsek, while Roseau’s Neal Broten received 73% of the vote against Warroad’s Dave Christian. Mayasich & Broten will face off in the finals. In the “Big Head” bracket, UMD’s Bulldog Mascot “Champ” earned 61% of the vote over the Grand Rapids “Thunderhawk”. Champ will now face “Bucky Beaver” from Bemidji State University, winner over the Minnesota Wild’s “Nordy” in the final round. Voting for the finalists in all rounds is now underway and will continue through this week. To cast your ballot, go online at www.letsplayhockey.com. Click on the “Hockey Hotdish Tournament” and then click on “Quarterfinals/Bracket Finals”. The DHSC “Barn Bracket” selection is found at number 3. 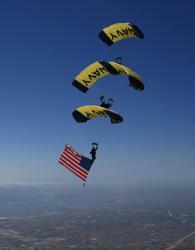 Most notably is a change in the U.S. Navy SEALS Leap Frog parachute demonstration. The event has been moved from 1:00 PM to 2:30 PM due to some air space restrictions. Also, with adverse weather conditions in the forecast, the Leap Frog demonstration may be cancelled. ON TO THE FINAL FOUR! The Duluth Heritage Sports Center (DHSC) outpolled Mariucci Arena, gaining 53% of the popular vote during the second round of the online “Hockey Hotdish Tournament ‘s Barn Division. With this win, the DHSC becomes one of the final four arenas still in contention for the title of being the Minnesota ice arena that best represents the State of Hockey. The DHSC will next take on Grand Rapids’ IRA Civic Center, while in the other bracket, voters will choose from the Eveleth Hippodrome and Roseau’s Memorial Arena. The Hippodrome advanced by receiving 63% of the vote over Thief River Fall’s Ralph Englestad Arena, while voters selected Roseau over the Warroad Gardens by a 68%-32% margin. Minnesota’s oldest hockey newspaper, Let’s Play Hockey, is hosting this event which offers 4 brackets…Beauty (players), Bench Boss (Coaches), Barn (Arenas) and Big Head (Mascots). Voting in the Big Head (mascot) division is currently underway, with Duluth East’s Greyhound competing against Nordy, the Minnesota Wild mascot. Voting in the Barn division will continue during the month of August, with the exact dates to be announced soon. Voting will again be online at www.letsplayhockey.com. Click on the “Hockey Hotdish Tournament” and follow the prompts to the “Barn Bracket Round”. After receiving great voting support from community and statewide supporters, the Duluth Heritage Sports Center (DHSC) has earned the bragging rights as the Minnesota arena that best represents the State of Hockey by out-polling the Roseau Memorial Arena by a margin of 69% -31%. The DHSC was one of 16 arenas chosen by Let’s Play Hockey, Minnesota’s oldest hockey newspaper, using conventional tournament brackets to make this selection. The arenas were classified in the “Barn” bracket, while other brackets were used to select a player (Beauty), coach (Bench Boss), and team mascot (Big Head). In advancing from its 14th seeded slot to claim the title, the DHSC outpolled other noted icons such as #3 ranked Hibbing Memorial Arena, # 6 Mariucci Arena, #10 seed IRA Civic Center (Grand Rapids) and, finally the #4 seed Roseau Memorial Arena. The Tournament voting continues this week in a semi-final round, pitting player against coach and arena against mascot. The winners of this round will face each other next week in the finals. In other voting, Roseau’s Neal Broten outpolled Eveleth native John Mayasich in the “Beauty” bracket, while Minnesota hockey iconic coach Herb Brooks prevailed over Dave Palmquist, a noted pioneer in girl’s high school hockey. Broten & Brooks will face off in the semifinals. In the “Big Head” bracket, UMD’s Bulldog Mascot “Champ” lost a close contest by 1 percentage point against “Bucky Beaver” from Bemidji State University. Bucky now faces the DHSC in the semi-final bracket. DeMeo said he was unsure why the tournament continues now that the winner in each of the four brackets has been selected. “You’ll have to contact Let’s Play Hockey” for the answer to that question.” he commented. “We’re happy with the “Barn” bracket outcome. Voting for the semi-finalists is now underway and will continue through this week. To cast your ballot, go online at www.letsplayhockey.com. Click on the “Hockey Hotdish Tournament” and then click on “Semifinals Bracket”. The DHSC's Giuliani Hall was alive with Halloween celebration opportunities for youth of all ages. For more photos, click on the City of Duluth Programs tab. On Wednesday, October 29 the DHSC was converted from a sports center into a "scary" palace as nearly 300 youth & family members donned their skates, costumes & masks to celebrate Halloween in the "Boo Bash". The event offered a variety of entertainment for all in attendance, even those who didn't skate, irrespective of age. With the option of visiting "haunted" locker rooms to joining in with table activities to having their faces painted, there was something for everyone to enjoy. In Sill Arena, the lights were on low, with special atmosphere provided by the flashing lights and special Halloween music furnished by noted Duluth Disc Jockey Shelley Bergen. The event was planned and operated by the City of Duluth Parks & Recreation Department, with collaboration from the Boys & Girls Club, the Duluth Children's Museum and the Duluth Heritage Sports Center. The next special skating event will the Thanksgiving "Gobbler Glide" on Wednesday, November 26th. Peterson Fund Scholarships: Austin Burley (Denfeld); Jared Williams, (East). Gibson Fund Scholarships: Elizabeth Bergh (Denfeld); Kelly Punkyo (East). The four recipients qualified for the DHSCF scholarships by virtue of their nomination by their respective school’s faculty members for consideration for the Minnesota State High School League's (MSHSL) Triple AAA Award. The minimum requirements for both awards are similar. Nominees must have notable achievements academically, participated in interscholastic sports and fine arts within their schools and have demonstrated positive citizenship traits during their high school careers. The $500 scholarships will continue to be awarded annually to ISD 709 seniors. During the 2014-15 high school hockey season, every time a Duluth High School Hockey team scores a power play goal, the cost of a college education for four (4) Duluth High School seniors becomes more affordable! Through a special arrangement with the Duluth Heritage Sports Center Foundation (DHSCF), Patrick D. Francisco & Associates, a financial advisory firm helping people create sound retirement strategies, will provide a financial donation with each power play goal during the regular season to help fund four $500 scholarships to be presented to both male & female student athletes from Duluth Denfeld & Duluth East high schools. Male athlete scholarships will be awarded through the Ray Peterson Fund. The female scholarships will be awarded in the name of former Duluth school teachers Thomas & Katherine Gibson. The DHSCF administers both funds. Scholarships will be awarded on the basis of citizenship, academic performance and athletic participation in any interscholastic sport, as determined by members of the school’s faculty. The scholarship program will be promoted during each high school home game as the “Power Play Payoff”, presented by Patrick D. Francisco & Associates. All proceeds, without exception, will benefit the scholarship funds. Recently, the Dave Goldberg Family Branch of the Boys & Girls Club was added to the “Safe Place” sites in Duluth. The Goldberg Branch is housed in the Duluth Heritage Sports Center. “Safe Place” is a refuge for youth at risk. Any young person who has run away or is in a threatening situation is able to receive assistance at any place identified by a yellow-and-black diamond shaped sign that indicates that the facility has staff that has been trained to provide this assistance. When sought out as a place of refuge, personnel at the Boys & Girls Club will call a volunteer who will provide transportation for the young person to the Lutheran Social Service’s Bethany Crisis Shelter in Duluth. Within 30 minutes, a trained representative of the agency will visit with the youth and address the situation. 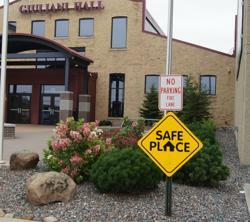 The “Safe Place” sign is located at the front of the DHSC Entry Plaza. Those who watched the TCF Bank outdoor hockey game between the Minnesota Wild and the Chicago Blackhawks on Sunday, Feb 21, may have been surprised when Duluth's own Mark Sertich appeared live on the broadcast during the second & third periods. "Sertie" was invited to the game as the guest of NBC. He was introduced by NBC analyst and former Blackhawk Jeremy Roenick as being the oldest hockey player in the U.S (and possibly the world) who still plays the sport competitively. When asked by Roenick if he also plays golf, Sertie responded that he always intended to take up the game when he got too old for hockey. He just hasn't got there yet. Sertie still plays morning hockey at the DHSC three days a week and will again be a participant in the Snoopy's Senior Adult Tournament held in July, in Santa Rosa, CA. The Minnesota Ice Arena Managers Association (MIAMA), under the leadership of MIAMA’S Northeastern Director Emeritus Walt Bruley, recently organized a Duluth and Hermantown area rink tour. On Wednesday, June 8, rink managers from Mars Lakeview Arena, Hermantown Arena, Fryberger Arena, Superior Amateur Hockey Association Arena and Wessman Arena visited the Duluth Heritage Sports Center to tour our facilities and to discuss issues of mutual concern. DHSC Arena Manager Tom Kowalik conducted the tour. In addition to the DHSC, Mars Lakeview Arena, Hermantown Community Arena were also on the tour, followed by a MIAMA hosted lunch at Perkins Family Restaurant in West Duluth. Of significant interest was the compressor room where the group learned about the DHSC’s recent upgrade to variable frequency drive motors for all of its compressor and pump motors. With the new VFDs, these motors will operate at a variable level of efficiency required to optimally maintain the ice temperature, rather than the on-off function of the replaced motors. The resultant energy savings together with Minnesota Power rebates are expected to pay for the conversion within the first year of operation. Founded in 1975, is a volunteer organization of arena managers and allied businesses dedicated to improving the industry by sharing of information, innovative ideas and techniques through meetings, seminars, newsletters and surveys. Current membership consists of 155 Minnesota arenas, 21 out-of state arenas, 9 organizations/associations and 69 vendor members. 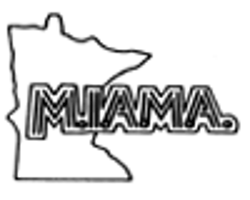 MIAMA holds two meetings annually where members and vendors meet to discuss scheduling, ice maintenance, equipment, refrigeration, infrastructure, air quality, and other issues pertaining to ice arena operations. Shayne Ratcliff if Lakeville is the organization’s current president. 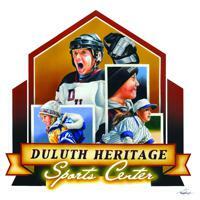 Kenneth J. Kolquist will join the Duluth Heritage Sports Center (DHSC) as Community Relations Associate. He will be responsible for working with the facility’s rental tenants and advertising clients as well as providing management for the DHSC’s special activities and events. Ken is a native Duluthian who grew up playing hockey on our outdoor rinks in the winter and baseball during the short summer season. He is a graduate of Duluth Central and the College of St. Scholastica (CSS), where he excelled as a four year athlete both in hockey and baseball. After he graduated, he continued to serve as an assistant baseball coach and is a member of the CSS baseball Hall of Fame. Ken also excelled academically,graduating with honors and a degree in Applied Economics. He is also a past recipient of the Duluth News Tribune’s Top 20 under 40 recognition. East boys headed to the State Tournament in St. Paul! The Athol Murray College of Notre Dame Hounds (Wilcox, Sask.) netted two third period goals 31 seconds apart, to take a hard-fought 2-1 victory over the Minnesota Blades in the 18U championship of the 2014 Holiday Inn & Suites Tier 1 Midget Hockey Showcase, held during Oct. 24-26, in Duluth MN. ©2019 Essentia Duluth Heritage Center / SportsEngine. All Rights Reserved.